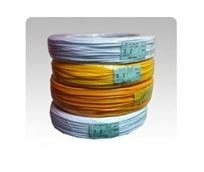 Our high quality and durable vinyl wire marking tubes are mostly used with variety of thermal printers for wiring identification. Manufactured in Japan, these genuine weather-resistant PVC marking tubes are available in different sizes based on the Inside Diameter (ID) and wire sizes (depending upon insulation thickness). ID of these marking tubes range from 2.0mm to 8.0mm for 26 AWG to 6 AWG wires. Available in White, Orange, Red, Blue, and Yellow color (Other colors are also available upon request). 100 meters or 200 meters or 300 meters length per roll. RoHS compliant. The prices range from $45.50 to $154.50.